Derrick Truby Jr. plays Winnie the Pooh and Billie Krishawn, Piglet. There’s more to Pooh than meets the eye. To kids, he’s a lovable, accepting friend who finds the good in almost everything. For adults, he’s a prophet; a spiritual leader — don’t be fooled by the stuffed-animal exterior. Can audience members expect a familiar old classic or a new twist on an old bear? CultureSpotMC.com spoke with the show’s key players for a peek behind the curtain. Director, Helen Hayes-nominated Shirley Serotsky, admits that her 1970s childhood didn’t include much Milne. This allowed her to start fresh. She began with the backstory. Milne, Serotsky discovered, returned to London after serving in World War I with Post Traumatic Stress Disorder (PTSD). Overwhelmed by the city, “Milne moved to the country and created these characters for himself and his young son. Creating this imaginary world served as sort of therapy for him,” she said. 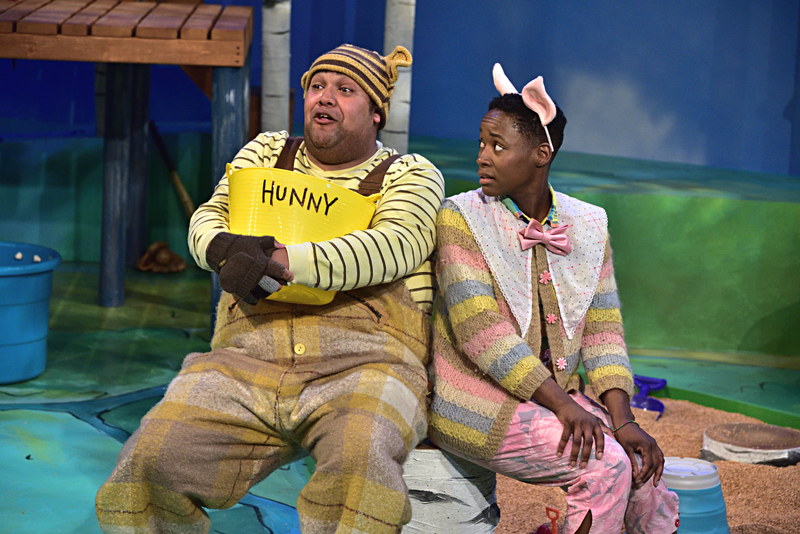 Winnie the Pooh, Stephen Murray as Rabbit and Billie Krishawn as Piglet. A parent of a young child herself, Serotsky, is excited by the lessons and values families can derive from the show. While “television and electronics compete for imaginative play, an anti-screen world is important” to childhood, she said. She further pointed to the relevance of the characters. They are ageless. “Kanga represents the new and unknown. He instigated a reaction of fear at first,” she said, likening his plight to current events, while Eeyore embodies the pessimist who is depressed and gloomy. “He is sad, but wants good things…like friends and fun,” leading us to wonder if Eeyore represents the author (Milne) or illustrative of the mental health struggles so many face. “We are very excited that D.C. kids get to see the diversity of the cast and production team actually reflecting the region’s diversity. (ATMTC has committed to hiring 50 percent artists of color for its productions onstage and offstage.) So, children will not only relate to the people onstage who look like them, they will also delight in the creativity that they will see come from the joy of active play,” Bobbitt said. His admiration for Serotsky’s direction runs deep. “Shirley is one of the smartest, most creative and collaborative people I’ve ever had the chance to work with. Every day, rehearsal is open to everyone in the room. What I love most about Shirley is that she affirms all ideas, but goes with the best one, regardless of if it came from her or not. She’s an excellent example of how to serve the story in the best way possible,” he said. ATMTC’s Communications Director Amanda Bradley noted that “the only cast members who have been on our stages before are Billie Krishawn (who played the sister character in “Jumanji”) and Sally Horton (who played the mother in “Alexander and the Terrible, Horrible, No Good, Very Bad Day”). The rest of the cast is new to our stage,” she said. Bradley also highlighted one of the most enchanting production touches of all, one that was entirely unplanned: the natural wooded backdrop of Glen Echo Park, home to ATMTC. “This gives a nice illusion of [Milne’s] Hundred Acre Wood,” she said, making it the perfect venue to introduce or reacquaint your kids with Winnie the Pooh. 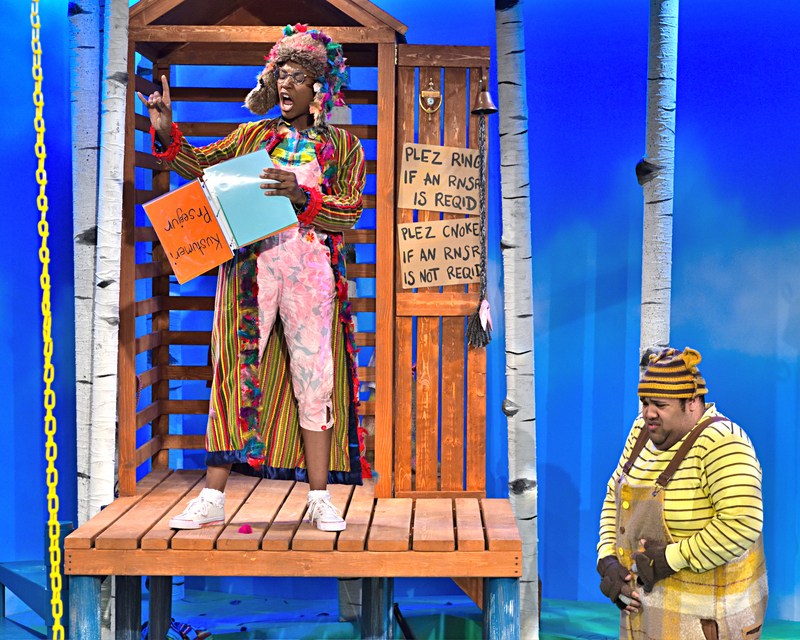 Adventure Theatre-MTC presents “Winnie the Pooh” through May 26 in Glen Echo Park, 7300 MacArthur Blvd., Glen Echo. Shows start at 10:30 a.m. Tuesday through Friday; 11 a.m. and 2 and 4:30 p.m. Saturday, and 11 a.m. and 2 p.m. Sunday. Carousel Day performances that include a free ride on Glen Echo’s Dentzel Carousel, are at 11 a.m. and 2 p.m. April 28. For tickets, $20, call 301-634-2270 or visit www.adventuretheatre-mtc.org; group and field trip rates are available.